Plastic bags are said to be the most common manmade item seen by sailors at sea. A UN report in June 2006 estimated that on every square mile of ocean there’s 46,000 pieces of plastic debris floating. Greenpeace says that at least 267 marine species are known to have suffered from getting entangled in or ingesting marine debris. Nearly 90 per cent of that debris is plastic. Marine wildlife eat plastic bags because they mistake them for jellyfish. Once in their guts, the bags cause intestinal blockages – which are deadly. Plastic bags become serial killers because they do not break down in the environment. 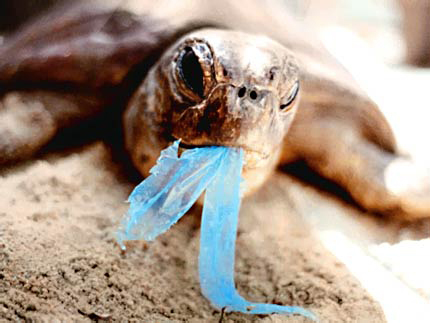 Once a creature which has ingested a plastic bag dies, it decays at a much faster rate than the bag. When the animal has decomposed, the bag is released back into the environment, more or less intact – and ready to be eaten by another misguided animal or bird. Plastic bags threaten urban environments as well as natural ones: plastic bags in drains were identified as major factors in the severe floods in Bangladesh in 1988 and 1998. This resulted in a ban on plastic bags being impose there in 2002. India also is discouraging the use of plastic bags nationwide. Plastic bags are costly in money terms too, both to produce and to clean up. Plastic bags are made from ethylene, a gas that occurs as a by-product of oil, gas and coal production (all non-renewables), which is transformed into chains of hydrogen and carbon molecules known as polymers or polymer resin. After being heated, shaped, and cooled, the plastic is ready to be flattened, sealed, punched, or printed on. Over 99 per cent of plastic bags cannot be recycled. The ones that are collected must be disposed of in landfill sites. very thick glossy ones made from linear low-density polyethylene (LLDPE). Manufacturers don’t need to use plastic for carrier bags. There are now an increasing number of degradable alternatives to plastic carrier bags, including corn and potato starch (which can even be composted). More and more countries, states and towns are taking action to ban plastic carrier bags, including Australia, Bangladesh, Botswana, California, Denmark, France, Germany, India, Italy, Philippines, Scotland, Somalia, South Africa, Southern Ireland; UK towns include Modbury, Hebden Bridge and Stroud. This entry was posted in Bag Campaign. Bookmark the permalink.